For bed bound patients, there may be a significant risk of pressure sore development, which can lead to a range of complications and an extended hospital stay. The Sidhil Softrest VE Pressure Relief Mattress has been designed with this in mind, and is made with castellated viscoelastic foam to provide both pressure relief and shear reduction. With a focus on increased comfort and longevity, this viscoelastic foam mattress is suitable for those at high risk of pressure sore development. Viscoelastic foam is an excellent material for providing comfort and pressure relief, helping to distribute a patient's weight across the mattress surface to reduce high pressure zones. This Softrest VE Pressure Relief Mattress uses this viscoelastic foam, and features ergonomic castellations within the foam to help reduce shear and enhance pressure relief. These castellated sections will move slightly with the patient, resulting in a reduction in the friction forces that can exacerbate pressure sore risk. This Sidhil VE Pressure Relief Mattress is supplied complete with a multi-stretch, water-resistant and vapour-permeable cover. 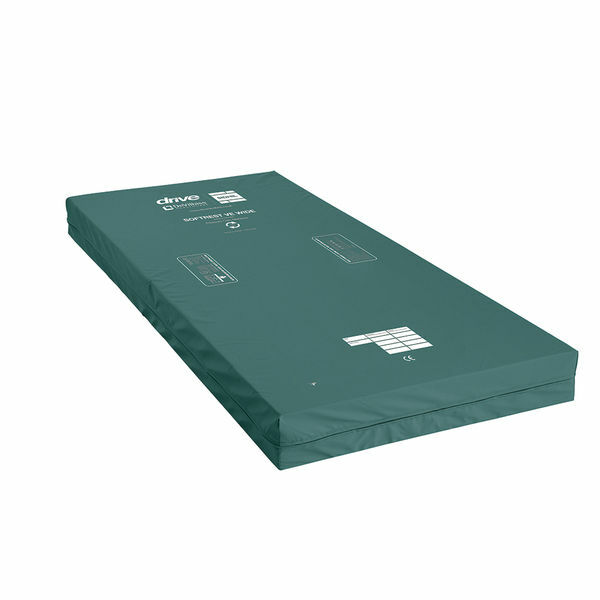 This cover will help to protect the foam of the mattress, while allowing air flow around the patient to reduce moisture that can lead to increased friction forces. Please be advised that the Sidhil Softrest VE Pressure Relief Mattress is usually delivered between 1 - 2 weeks of your order being placed. We would advise you to consider this delivery estimation before placing your order and apologise for any inconvenience that this may cause. For more information, please contact our Customer Care Team at 020 7501 0592.